This Jam Paper hat box really reminded us of a steamer trunk, and we thought it would make the perfect gift for stashing souvenirs and momentos after a trip. We used the paper maps to cut out a hert and then glued studs around the edge! 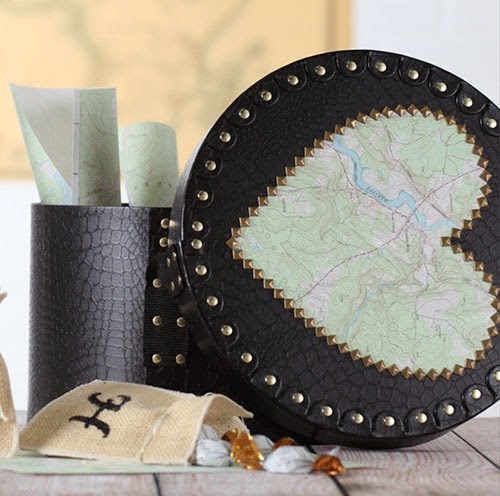 Using scissors, cut out the heart shape from the map paper and fit to the top of the hat box. Use large fabric paintbrush to apply a thin layer of Fast Grab Tacky Glue to the back of the paper heart. Position on top of box and smooth down. Let dry. Use a flat paintbrush to apply the Glossy Decoupage medium to the top of the heart in two or more thin coats, allowing each to dry before applying the next coats. Use the Fast Grab Tacky Glue to adhere flat-backed studs around boarder of heart. Let dry. If you want, add a monogram on the place you visited using glitter and glue for a special touch. 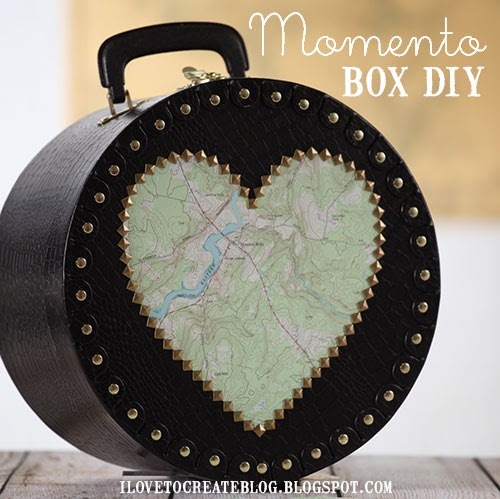 I did something similar with an old cigar box I found at a thrift store. Boxes are such a great way of storing mementos!